This article is a summary report of Muslim Brotherhood history of terror, since they started a series of assassinations and terror acts in Egypt from 24/2/1945 till 25/12/2013. 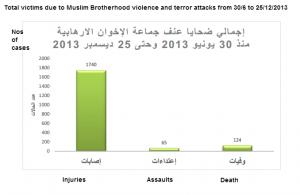 There is no doubt that Muslim Brotherhood are the parent of all terrorists groups. All terrorists groups including Muslim Brothers, committed violence and terror acts not due to oppression, but due to their main goal of ruling countries based on dictatorship and not partnership. Terrorism and crimes against humanity cannot be justified as a result of oppression. I wrote this report to whom it may concern, to ask very important questions: Why the Obama’s administration did not declare the Muslim Brothers as a terrorist group, despite their direct links and coalition with Al Qaeda, Hamas, Jihadi Salafi and Gamaa Islamia who are already declared terrorists by the US? Why the US Administration, UN, EU, foreign press and human rights organizations are marketing MB lies and deliberately ignoring all their documented crimes in Egypt and describing them as victims? Muslim Brotherhood had full power and authority in Egypt, they actually had the whole country under their control. If Muslim Brothers are moderate and democratic as they claimed, all they needed to do, was to gain people’s trust and gain popularity by working hard in meeting people’s dreams about freedom, social justice, reforms and decent living, when they had the golden chance to rule Egypt. Instead of working hard in developing the country, Muslim Brothers violated our rights, terrorized us from the first moment they reached power, controlled all the state’s joints, were smashing our entity and identity to replace it with brotherhoodization, dealt with all the country’s institutions and people as their enemies, were working hard on replacing police with Muslim Brotherhood militias, and were creating equivalent army from their Islamist Militants to replace our Armed forces with it. Muslim Brothers were not oppressed when they were ruling Egypt, but they practiced oppression and terror despite that they were in full authority and control. If there is no link between Muslim Brothers and other terrorist groups, why terror attacks started right after the overthrown of Muslim Brothers and not before? Doctrinal differences between Islamist groups creates armed violent conflicts between them. Islamist groups in Egypt did not have any conflict with Muslim Brothers despite the doctrinal differences, simply because they were allies. 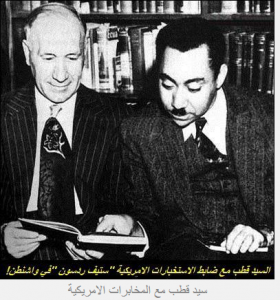 Muslim brotherhood organization established in 1928 by the Egyptian schoolteacher/activist Hasan al-Banna (a devout admirer of Adolf Hitler and the Nazis). Deception is the main factor that Muslim Brotherhood are using in their tactics, in order to convince the international public opinion that they are moderate Muslims, victims of oppression and they just seek to be partners in political life. Brotherhood use deception till they dominate a country and have full control on its joints, when the right moment comes, the deceiving tactics turns to the ugly reality and this exactly what happened in Egypt. Other terrorists groups disagree with the Muslim Brothers tactics, took the path of terror and violence as the shortest way to reach their goals. All terrorists including Muslim Brothers have only one goal, which is to reach power and build an Islamic empire based on their own fascist provisions which have nothing to do with Islam. Muslim Brotherhood are the parent organization of Hamas and Al Qaeda. 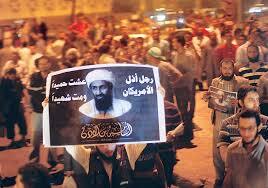 Osama Bin Laden was a brotherhood member and so was Ayman Alzawahiri the leader of Al Qaeda organization. 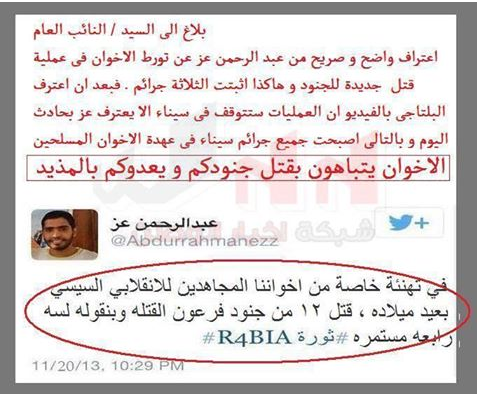 Mohamed Mursi’s former presidential chief cabinet, Refaa Altahtawy is Al Qaeda leader’s cousin. Mohamed Mursi issued 7 exceptional presidential pardon resolutions during 5 month from mid July 2012 to 1st of Jan 2013, for more than 810 dangerous terrorists elements, among them criminals, thieves, convicted with corruption, drug dealers, Egyptians and foreign terrorists elements who were involved during the 80’s and the 90’s of killing tourists, Christians, activists, writers, journalists, civilians, Late president Sadat, former President Mubarak, political figures, military and police individuals. This is really absurd! There were many debtors in prisons because they were not able to pay a fridge or a stove premiums to their creditors! These debtors were not terrorists nor thieves, they faced financial problems in paying their debts. These debtors were not really a high priority to be given presidential pardon other than criminals and terrorists! 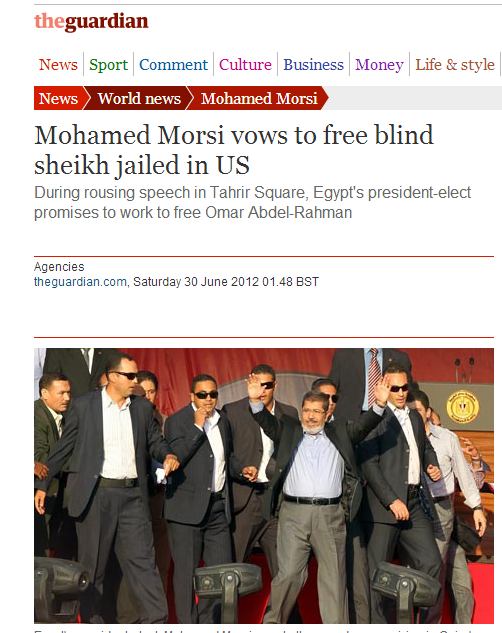 Mohamed Mursi violated the law and used his authorities and pardoned assassins! Many of the 9/11 conspirators came from the Muslim Brotherhood, including Mohammed Atta the ringleader of the 9/11, Khalid Sheikh Mohammed Senior Al Qaeda officer and Mastermind of the 1998 embassy bombings, the 2002 Bali bombings, the murder of Daniel Pearl, and the 9/11 attacks. Omar Abdel-Rahman Muslim cleric involved with terrorist groups and Mastermind of numerous terrorist plots. He gave a direct order to his followers to assassinate Late president Sadat on 6/10/1981. 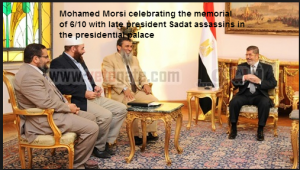 He was also the “Spiritual leader” of Osama Bin Laden and Islamist Groups in Egypt (Gamaa Islamia declared a terrorist group by the US and they are in addition to Hamas, the military wing of MB). Sadat’s killers and attackers would eventually come to be identified as Islamist nationalists associated with the Muslim Brotherhood under the name of Islamic Jihad. On 30/6/2012, Mursi vowed to free blind sheikh Omar Abdel-Rahman jailed in US, during rousing speech in Tahrir square and he was addressing his speech to Omar Abdel Rahman’s supporters in Egypt. The relation between Muslim brotherhood and other terrorist organizations went through different stages whether inside or outside Egypt. In the 70’s, the brotherhood third former chief Omar El-Telmesany established students committees in the Egyptian universities and this was the seed of extremism and terrorism which ended by assassinating Late president Sadat. Al Qaeda refused to communicate with The fifth chief of brotherhood Mostafa Mashhur due to Doctrinal differences, when he wanted to get into coalition with them to participate in the Arab Jihad war in Afghanistan and Pakistan. 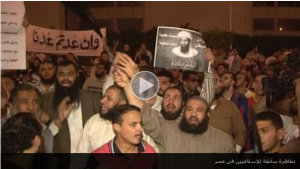 Masshur said that MB differed from Al Qaeda only in its tactics, but not in its goals. Muslim brotherhood supporters carrying Osama Bin laden’s picture, written:”Bin Laden, the man who humiliated America, is brave, hero and a martyr. Gamaa Islamia and Muslim Brotherhood members and supporters in violent protest in front of the National security building – Nasr city, Cairo 2013. After Muslim Brotherhood reached power in Egypt, many direct communications channels were opened between Muslim Brothers, Al Qaeda and other terrorists groups through Refaa Tahtawy Chief cabinet of Mohamed Mursi and cousin of Al Qaeda leader and the middle man Mohamed Al Zawahiri Al Qaeda leader’s brother in Egypt. 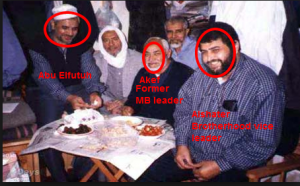 Muslim brothers allowed Al Qaeda to have their branch in Egypt under “Salafi Jihadist” and in return to support the Brotherhood regime in Egypt against any revolt. On 24 February 1945 Brotherhood assassinated Ahmed Maher prime minister of Egypt in the Egyptian parliament, after Hassan Al-Bana founder of Muslim Brotherhood organization lost the elections. On 22 March 1948, Brotherhood assassinated judge Ahmad Khazendar who sentenced to jail members of the Brotherhood committed terror acts in Cairo (burned Cinema Metro). He got assassinated right after the founder of MB declared to his students that he wished there was a way to get rid of this judge. On 28 December 1948 Brotherhood assassinated prime minister and political figure Mahmoud Fahmy Nukrashi after he dissolved the MB association. On 26 Jan 1952, Muslim Brothers burned Cairo. It was prepared by the British occupation and executed by Muslim Brotherhood. Mustafa al-Nahhas former PM decided to cancel the 1936 treaty with the British. On 25/1/1952 the British occupation brutally confronted the Egyptian resistance and the next day 26/1/1952, MB burned Cairo. (Muslim Brotherhood organization was supported by the British colonizer). In 1954 Muslim Brotherhood failed in assassinating Nasser while he was making a speech in Manshia square in Alexandria city. In 1965 Muslim Brotherhood formed a group of scientific researchers students and were experimenting manufacturing explosives, explosives belts, bombs and poisons to assassinate Nasser. 9/10/1956 The British Intelligence failed in assassinating Nasser through the BBC and the Daily telegraph correspondent in Egypt, who’s role was to recruit Nasser’s doctor to poison his food or a popular chocolate called at that time “Crobgy” in return of twenty thousand British pounds. Another failed attempt in 1956 to assassinate Nasser also by the British intelligence through nerves Gas in one of the air conditions located in Nasser’s residence. But this attempt was rejected by Robert Anthony Eden, the British PM who decided that the Tripartite Aggression against Egypt was the suitable way to handle Nasser and Egypt. Tripartite aggression was launched by Israel, France and Britain after Nasser nationalized the Suez Canal and declared that the Canal is a part of Egypt and belonged to Egyptians and not to the foreign countries or occupation. The tripartite against Egypt failed and Eden was forced to end his political life and resigned. Another failed attempt to assassinate Nasser by poisoned American apple, Israel was responsible for it. 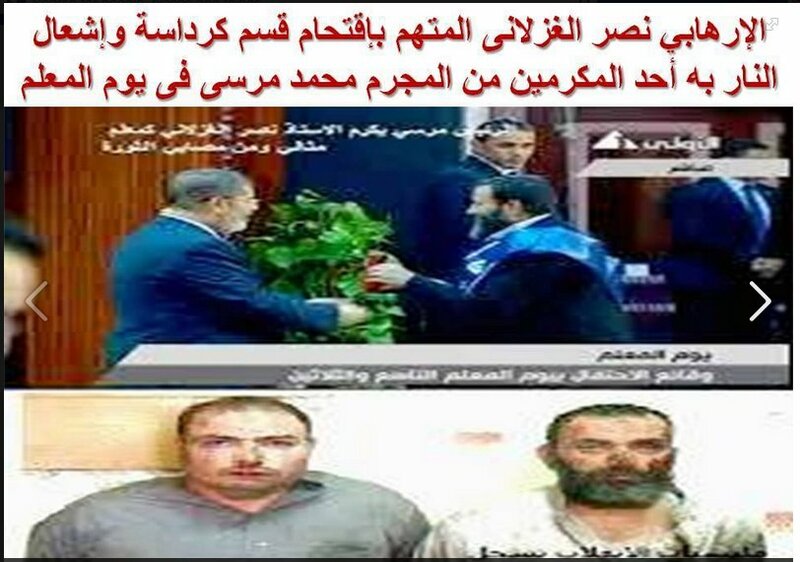 The last failed attempt by Iraqi cell in Egypt who belonged to Al-baath Iraqi party, but Nasser decided to release them without trial and sent them back to Iraq. On 17 November 1997, Al-gamaa Al-Islamia, the military wing of Muslim Brotherhood slaughtered 58 tourists in Luxor massacre and 18 tourists in the pyramids area. 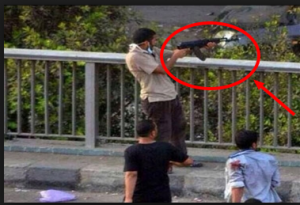 Mohamed Mursi assigned the man who ordered the slaughtering of tourists in Luxor as the Governor of Luxor in 2013. On 6 October 1981, Al-gamaa Al-Islamia in association with Muslim Brotherhood assassinated Late President Sadat. 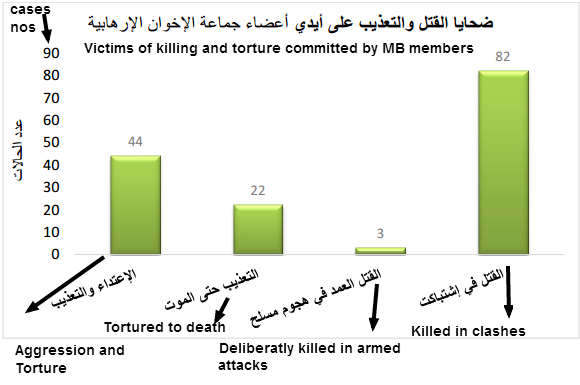 They also massacred and killed more than 118 Police individuals in Assiut security Governorate. Muslim brotherhood actually assassinated Late President Sadat twice: The first time when he got killed in the memorial day of 6 October war, the second time when Mohamed Mursi invited Sadat’s assassins in the presidential palace and they were actually celebrating Sadat assassination day. Karam Zuhdy, former leader in Gamaa Islamia declared to Alkahera Walnas channel, that it is the leaders of Muslim Brotherhood Organization who taught all Islamist groups, the violence and terror acts against the society. He indicated that it was not hard to communicate with Muslim Brothers due to the main role of the secret organization of Brotherhood founded by Hassan Albana, which helped in spreading the incitements ideas into the society. On 12 October 1990, the assassination of Rifaat el-Mahgoub important political figure and 3 of his guards in Egypt. On 8 June, 1992, the assassination of Farag Fouda Egyptian professor, writer, and human rights activist. Investigators asked his killer why did he kill him? He said because of his books. They asked him whether or not he has read his books? He said that he didn’t know how to read or write, he killed him because he thought he was an atheist. His assassin was given presidential pardon by Mohamed Mursi. On 11/3/1993, the assassination of a 12 years girl Shaimai while she was in her class, after a failed attempt to assassinate the prime minister Atef Sidki’s motorcade. 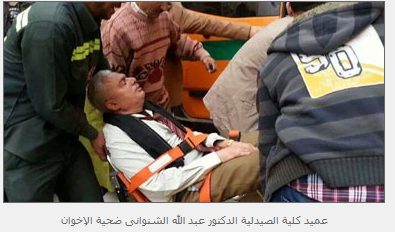 The leader of Gamaa Islamia who committed the terror attack at that time was Mohamed Abd El-Moneim Abu El-Futuh, Muslim Brotherhood former leader and former presidential elections candidate in 2012 and now he is running a political party in Egypt! 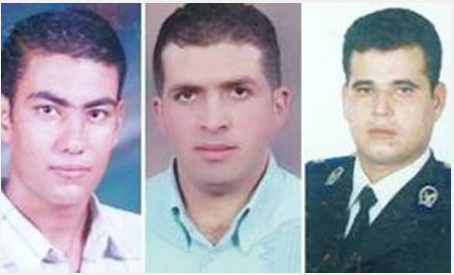 2/2/2011, 3 Egyptian Police officers were kidnapped by Hamas and were killed and buried in Gaza strip. Hamas refused to deliver the killers to the Egyptian authorities, and just announced that they were killed and buried in Gaza. And they denied their responsibility of killing them. August 2012, Rafah, 16 military Soldiers and officers were massacred by Hamas militia and refused to deliver assassins to Egypt and denied their relation to the massacre. 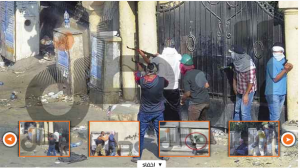 5/12/2013, Cairo – Etehadeya Presidential Palace massacre. Mursi and Muslim Brotherhood leaders incited and participated in the deliberate killing and torture of demonstrators in front of Etihadeya presidential palace. The massacre resulted the death of about a dozen (11) demonstrators and more than 800 got brutally tortured and seriously injured and also resulted with permanent disability for many, in violent clashes outside the presidential palace after Mursi enraged protesters with a decree expanding his powers above the law. 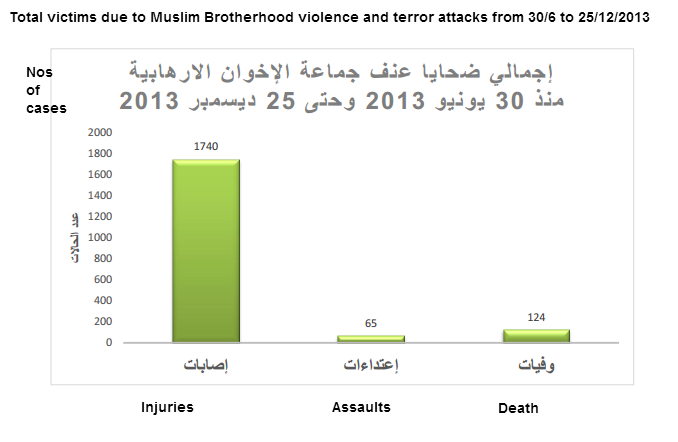 Ibn Khaldun Center’s report on Muslim Brotherhood violence, violations and terror attacks in Egypt from 30/6/2013 to 25/12/2013 the date Muslim Brotherhood organization was declared terrorist organization by the Egyptian government. On 14/11/2013, The final autopsy report exposed the Muslim Brothers, foreign press and human rights organizations fabricated stories about the Brotherhood victims which resulted from the disengagement of the armed sits-in. It also exposed the forged photos that MB and Aljazeera Channel of Qatar used to convince the world opinion that the disengagement was a massacre, using images of victims from Syria, Libya and south Africa. It also exposed Muslim Brotherhood faked interviews through Alzajeera, using women and children to address false stories to the world. 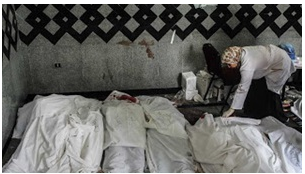 11 bodies were found buried in Rabaa’s mosque with severe torture marks. 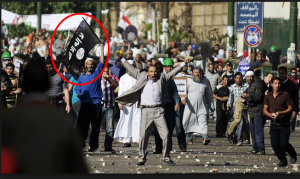 30/6/2013, Muslim Brotherhood snipers used the roof of MB headquarter in Mukatam area, Cairo and killed 12 protesters and seriously injured 48 others. 2/7/2013 MB protesters in Rabaa square attacked first lieutenant police forces Karim Emad Abd El-Hamid with white arms and wooden sticks, resulted with concussion and serious injuries in the left side of his stomach and in the rest of his body. The police lieutenant got attacked by MB protesters next to Rabaa square because he had the badge of the police on his car. They smashed his car and dragged him on the ground and stabbed him. 2/7/2013, Al-Sarayat area violent events. Hundreds of Morsi’s supporters burned two private cars for having a sign “Morsi get out of Egypt”. Attacked cars owners. Clashes started between citizens and Brotherhood supporters who started to shoot randomly at the people in the street. 3000 of MB supporters appeared later on the scene and used machine guns against the people in the area resulted 23 dead, 220 injuries. Most of the bodies were shot in the head and chest. In addition to the journalist Tamer Fayez who got brutally beaten by MB supporters resulted with broken ribs and blood clots, and a police officer got a shot in the head. 5/7/2013, Sidi Gaber Alexandria city. Muslim Brotherhood leaders and their supporters used white arms, firearms and Molotov against civilians in the area, resulted 22 dead, 180 seriously injured and 800 with minor injuries. 5/7/2013, the chief of Ambulance announced officially that the result of violent clashes all over the country was 36 dead and 1138 injured. 5/7/2013 Al-Manial Area, Cairo. 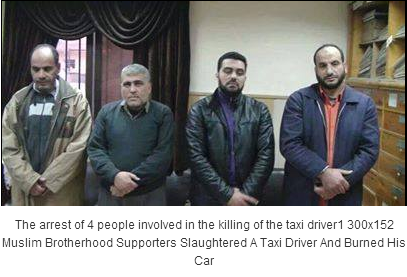 After Muslim Brotherhood supporters failed to attack Anti-Muslim Brotherhood protesters in Tahrir square, they headed to Al-Manial area and started to shoot randomly on people in the neighborhood, which resulted 6 dead and 30 injured. The majority of victims were shot in the head, one got shot in the back and a rescue officer was shot in his stomach. 12/7/2013, Muslim Brotherhood supporters kidnapped Mastour Al-Gebaly (member in the popular trend), he got tortured in Rabaa square (MB sit-in). 13/7/2013, Al-Hag Fathy and another eyewitness who were in Rabaa square, testified that they eye-witnessed torturing tools inside Rabaa sit-in and some police individuals were kidnapped and tortured inside Rabaa Sit-in. One of the victims they eye-witnessed was brutally tortured by MB in the square, Ahmed Zulaifah who was found dead later on with severe marks of torture all over his body. 15/7/2013, MB kidnapped a civilian and tortured him to confess that he was a police individual, then they threw him in the street. 22/7/2013, Ahmed Abd Elhamid Mustafa (paramedic) 23 years old resident of Alsharkia city, found the dead body of Amr Magdy Kamal Aly Samak 33 years old, labor, was found outside Rabaa square with severe bruises and torture marks all over his body and especially on the chest and stomach, his fingernails and toenails were removed. 22/7/2013, two police individuals Mohamed Amin and Hany were kidnapped by Muslim brotherhood supporters to Rabaa square, beaten and tortured, they got rescued by some of their colleagues who managed to get to the square and saved them. 24/7/2013, two dead bodies and three others were seriously injured, found close to Nahda square (MB sit-in in Giza). The two bodies had torture marks. Investigations revealed that they were attacked and tortured inside Orman garden by MB protesters and were thrown close to Nahda square. 25/7/2013, Arafa Ahmed Gouda was kidnapped and dragged to Nahda square for carrying CC’s picture, testified that he was brutally tortured by MB protesters, then they put him in a big carton and threw him next to Faisal bridge in Giza. 26/7/2013, Al-Kaed Ibrahim Mosque clashes, Alexandria city. Clashes started between Anti-Muslim Brotherhood protesters and Muslim Brotherhood supporters. People managed to disperse MB supporters. Muslim Brothers got to the roof of the mosque and started to shoot randomly at the people in the street. Resulted 5 dead and 72 injured. Muslim Brothers kept 16 men hostages inside the mosque, and were using white arms, firearms, whips and handcuffs in torturing them. with boiled water and electricity and cut his left hand finger. They threw him in the fifth settlement area in a deserted street. 28/7/2013, Four bodies were found behind Rabaa Mosque and in two different areas in Nasr city with torture marks, bruises and deep wounds in the head. The people who lived around the MB sit-in in Rabaa accused the Muslim Brotherhood leaders and their supporters of torturing and killing these victims inside the square. 29/6/2013, Al-Arish, Brigadier Mohamed Hany was assassinated in his car and his driver got injured by masked gunmen. 4/7/2013, armed attack against a police ambush in north Sinai resulted the death of Yehia Moamed Abu Al-Magd 22 years old shot in the head. Captain Omar Abd ElRahman 29 years old, injured with a gunshot. 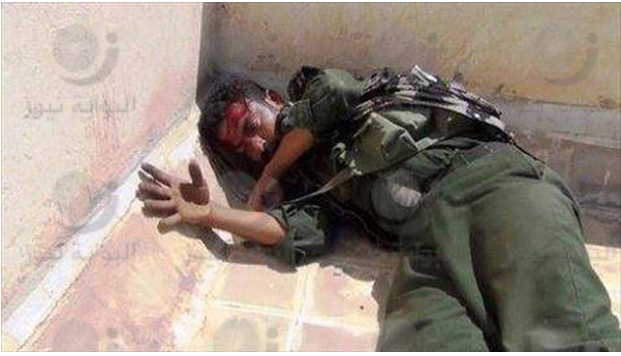 Soldier Ossama Alsaid Fath Allah 22 years old shot in the head. 5/7/2013, gunmen opened fire on 5 security points close to Al-Arish Airport. No injuries or casualties were reported. 13/7/2013, RBJ missiles were launched at Al-Arish international airport, military ambush and police tank resulted the death of brigadier Mohamed Abu Elenen and one soldier injured. In addition to gas lines blown-up and armed attacks against police stations and military establishments. both armed sits-in, forced them to wear shrouds and carried signs “Egyptian children martyrs project”, ” I don’t want chocolate or candy, I want a bullet between my eyes”. 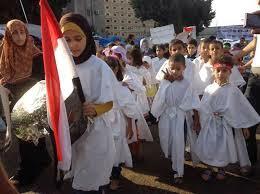 Local and international human rights organizations condemned Muslim Brotherhood violations against children’s rights. Muslim Brotherhood kidnapped children from orphanages and forced them to stay in an armed sit-in and exposed their lives to danger. 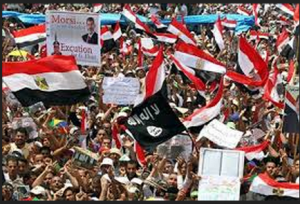 29 and 31 July 2013, Muslim Brotherhood announced on Rabaa and Nahda stages that elements from Al Qaeda organization and Jihadi Salafi joined their sits-in and declared the formation of a war council against all MB’s opponents and the Egyptian military and police forces. Muslim Brotherhood leaders announced that there won’t be any peace or peaceful protests in Egypt, and that Al Qaeda and Jihadi Salafi elements joined their war council against anti-Muslim Brothers, military and police forces. They sent threats messages to the armed forces of withdrawing from Sinai, otherwise Sinai will turn to blood bath. 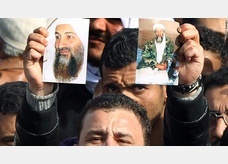 Black flags of Al Qaeda and Bin laden images were raised and carried in both squares. In the following video, Ahmed Amer, Brotherhood member asked MB supporters to burn the Egyptian flag and replace it with Al Qaeda black flag. 29/7/2013, The ministry of Interior announced the total bodies found in Rabaa and Nahda squares carrying torture marks led to death were 11 bodies. The total official statements the ministry received from citizens accusing Muslim Brotherhood of kidnapping and torturing them were 10. 29/7/2013, Islam Rashad Ramadan resident in Algalaa street Mansoura city, got killed by Muslim Brotherhood supporters in front of the Olympic village. Islam was sitting on the fence of the Olympic village, Brotherhood suspected that he was a police individual or spying on them, they got him down and hit him with a marble on his head and stabbed him many times till he died. 30/7/2013, Omar Mohamed Salem Ibrahim. His body was found after being missing for two days. The body was found with severe torture marks. Investigations revealed that he was working inside Rabaa square serving tea and coffee. 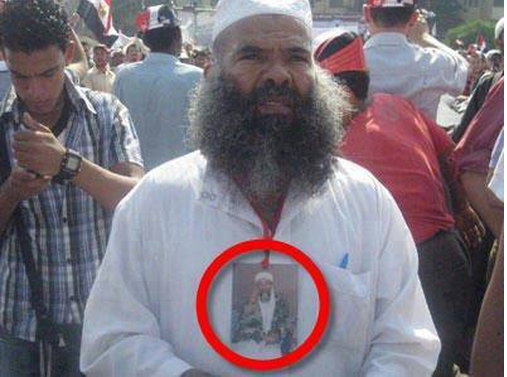 His father accused Muslim Brotherhood of torturing his son to death inside Rabaa square. 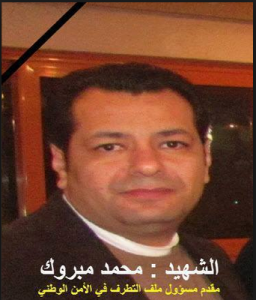 30/7/2013, Hany Musa Abd El-Aziz from shatanof village Ashmun center, Munufia city, He worked in one of the Armed forces hotels in Nasr city. 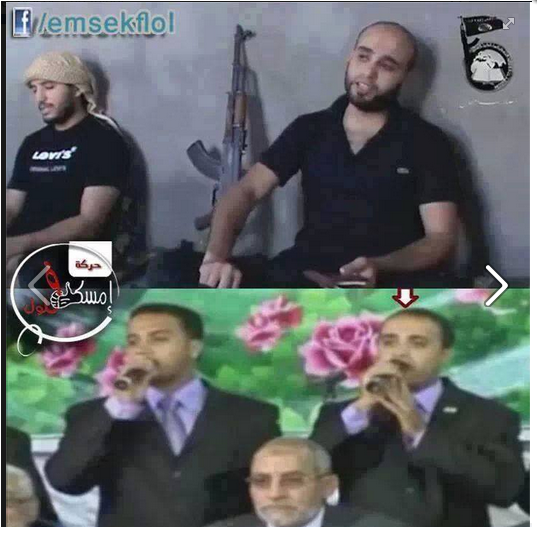 Muslim brotherhood kidnapped him and took him to Rabaa square. This young man got so brutally tortured which resulted: deafening, muteness, he lost his awareness, lost memory, 6 deep wounds caused cracks in his skull caused by sharp tools, penetrating wounds in the neck and abdomen led to internal bleeding caused the immiscible of urine with blood. In addition to more than 45 stitches in his head. He lost consciousness and speech and lost memory and was not able to remember even his parent. Confession by MB leader Beltagy that terrorism in Sinai is in retaliation to mursi’s ouster. He said that all operations in Sinai will stop, the minute Mursi is back to power, otherwise it will continue. 1/8/2013, a 15 years old boy got tortured by two Muslim Brotherhood leaders, They shaved the boy’s head and removed his nailtoes and caused some burns all over his body and face. Used electric zapper in torturing him. He was waiting for a bus close to Rabaa square and MB supporters suspected him and took him inside the square. August 2013. Alfayoum City, Muslim Brotherhood supporters brutally tortured Egyptian Police officer to death. The following video contain very violent scenes and not appropriate to watch for some ages. Muslim Brotherhood supporters attacked Tamia Police station in Fayoum City and started to beat the police officer with sticks on his head and different parts of his body till he died. 1/8/2013, Muslim Brotherhood activist Ahmed El-Mugheer and other MB members kidnapped a photographer of Al-Masry Al-Youm newspaper Tarek Wagih, beaten him brutally and took his camera then threw him out the square after a couple of hours. 1/8/2013, MB supporters in Nahda square grabbed a 20 years old young man from the street took him inside the square for 15 minutes, got him out with his eyes covered and his hands tied behind his back and attached him to a tree for long hours. 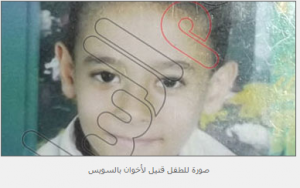 1/8/2013, Muslim Brotherhood supporters killed a boy in Ismailia city, after MB announced the formation of war council against the Egyptian society and military, MB supporters used firearms and started to shoot randomly and killed the boy. 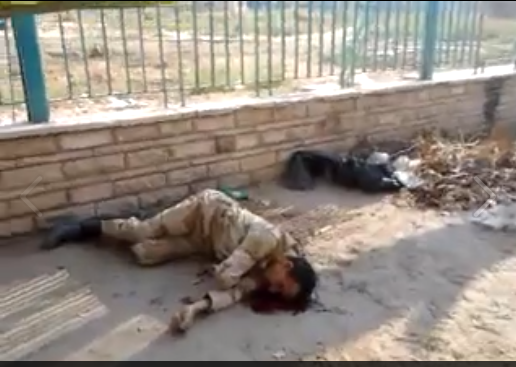 14/8/2013 Brotherhood elements shot an Egyptian Military individual in the head. 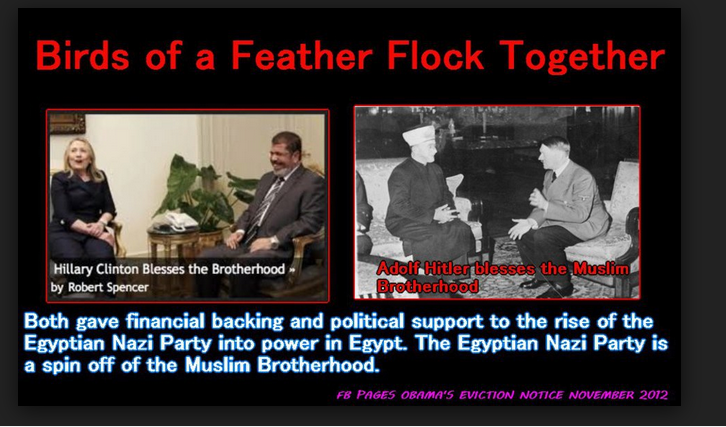 Muslim Brotherhood and their supporters. 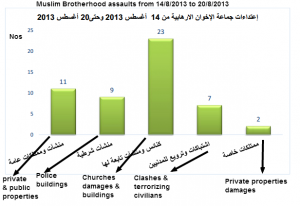 Churches and police stations had the biggest share of damages, burning, looting and terror acts. 73 churches and its establishments got looted, burned and damaged, in addition to catholic schools burned and damaged. Many Christians got killed, terrorized and forced to leave their homes. Muslim Brotherhood terrorized citizens, burned public and private properties and massacred many police individuals in this day and burned their police stations. This day Egypt was under terror attacks launched by Muslim Brotherhood in association with Al Qaeda and Gamaa Islamia “council of war against the Egyptian society” announced by Muslim Brotherhood. (videos and images provided in the above two links covering terror attacks from 14/8 to 18/8). 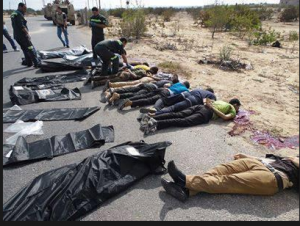 19/8/2013, Rafah AlArish Sinai, 25 Egyptian soldiers of central police, dragged from the bus and were shot in the back and head. 11 armed terrorists elements executed the massacre. 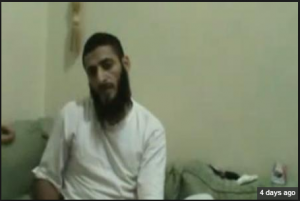 The leader of the terror attack is Adel Habara “his nick name”. 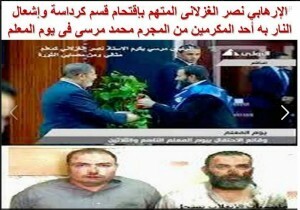 One of the terrorists elements given presidential pardon by Mohamed Mursi. Nasr Elghezlany a muslim Brotherhood member who prepared and led the attack and massacre of Kirdassa Police station. 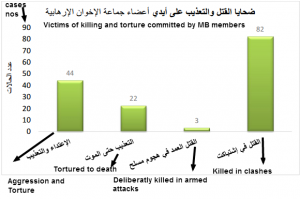 Him with other MB elements tortured and massacred 12 soldiers and officers on 14/8/2013. 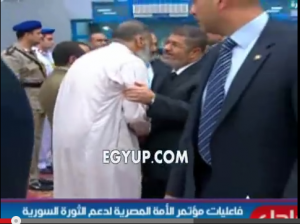 Mursi was rewarding him in the teacher’s day! 21 August 2013 – Sidi Gaber, Alexandria. 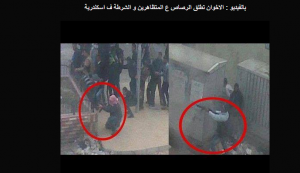 two Muslim Brotherhood members and a totally covered sisterhood opened fire on police security forces. Resulted Police soldier shot in the stomach and a citizen shot in his legs. Police arrested the attackers and seized mechanism shots and 2 riffles, and badges typed: We are “backing Mursi”. 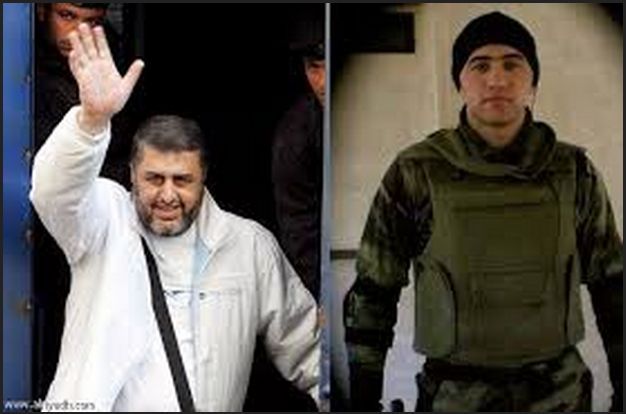 Names of the arrested attackers: Zeyad Bassiony – Islam Mursi – Atteyat Abd Elmohsen. They confessed in front of investigators that they were charged of this mission to get revenge from those who are stopping them from supporting Islamic Sharia. 23/8/2013, Behera – Delengat city. violent clashes started by Muslim Brotherhood and their supporters against civilians, resulted 3 injured and public and private properties damages. 23/8/2013, Sharkia – koren city. Muslim Brotherhood supporters burned a police station and started clashes with Zeid family, resulted 15 injured from Muslim Brothers members and 3 injured from Zeid family. 23/8/2013, Gharbia city, Tanta, Albahr street. 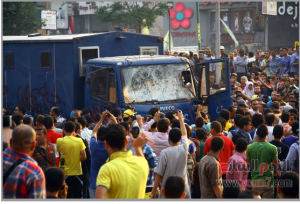 Clashes started between MB and civilians, resulted Momen restaurant damages, 1 dead and 26 injured. Terrorist element of Ansar Beit Elmakdes declared responsibility for recent terror attacks in Egypt appeared in the picture with the Head of Muslim Brothers Mohamed Badie. tore through his convoy, wounding 22 people. 4 police cars of his guards, many shops and private cars were destroyed due to the explosion. Many of his guards were injured. 12 police individuals were injured. Ansar Beit El-Makdes announced their responsibility for the assassination. 6/9/2013, Tanta city. 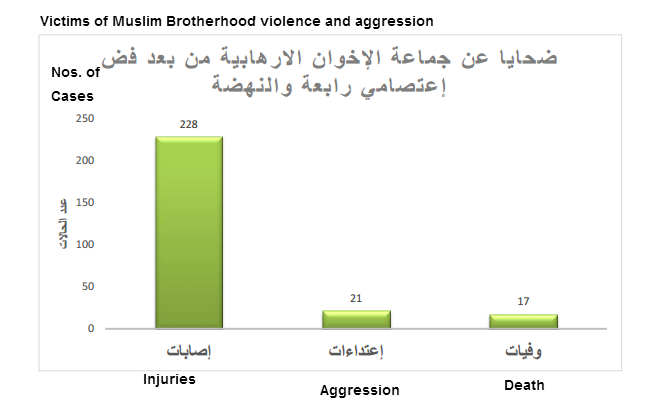 Muslim Brothers supporters damaged private and public properties, and tens of civilians injured. 11/9/2013, Damietta. Muslim Brothers members burned Mohamed Elhefnawy’s home after they stole all his house’s contents. 13/9/2013, Cairo – Gisr El-Suez street, Muslim Brothers destroyed and damaged Mobinil branch owned to Sawiris a wealthy christian businessman, MB wrote on the shop’s wall that they will slaughter the Christian businessman. 13/9/2013, Cairo Nasr city, Youssef Abbas street, Muslim Brothers attacked and beaten Omar Elsayed the photographer of Yakeen network, and broke his camera, while he was covering Muslim Brothers attack against a military vehicle that was passing by. 13/9/2013, Abu Kebir city, Muslim Brotherhood supporters attacked civilians, used white arms and firearms, resulted injuries of : Islam Sayed Zaky 19 years old, Mohamed Elbaz Eldessouky 20 years old residents of Damietta city. Ahmed Mohamed Ibrahim 17 years old resident of village Awlad Fadl in Abu Kebir center, Mohamed Ahmed Elsayed 18 years old resident in Manshia street in Abu kebir city, Mohamed Mohamed Abd Elatif 27 years old, Mohamed Ismail Abd Elkhaleq 21 years old residents in Abu Kebir city. 17/9/2013, Damietta. The police arrested Muslim Brotherhood member Ayman K. H. 24 years old in Meit Abu Ghaleb center Kafr Saad, who had an explosion in his house while he was making and preparing explosives and grenades to use them in terror attacks. Police found in his possession, military and police uniforms, Chemicals, wires, Carbon potassium, sulfuric acid, highly flammable materials and electric circles. 19/9/2013, Giza. The Police and the national security arrested Muslim Brotherhood leader Fares Ibrahim Ossman Alkahwagy 56 years old, merchant of motorcycles spare parts. Wanted for lawsuit ref. number 2013/4481 Alwarak Police station. He is convicted of theft, and burning the police station of Warak. 27/9/2013, Cairo – Giza. Muslim Brotherhood attacked and damaged public transportation and drivers in Nasr city. Blocked Gamet Eldowal street in Mohandessin. Used Children as human shields in front of of police forces. Blocked Youssef Akad street in Nasr city. Damaged and destroyed police vehicles in Mohandessin – Abused and offended Christians in Maadi – Removed the Eagle from the Egyptian flag and replaced it with the word “Monotheism”. 4/10/2013, Al-Qasr Eleiny street Cairo. Khaled Dawood the official spokesman of El-Dostour Party, was attacked by Muslim Brotherhood supporters, when he was driving by coincidence next to Brotherhood protests, they dragged him out of the car, smashed it and stabbed him many times in the chest with a sharp tool. In addition, He was stabbed twice in the face and got a cut in his hands by white arms. 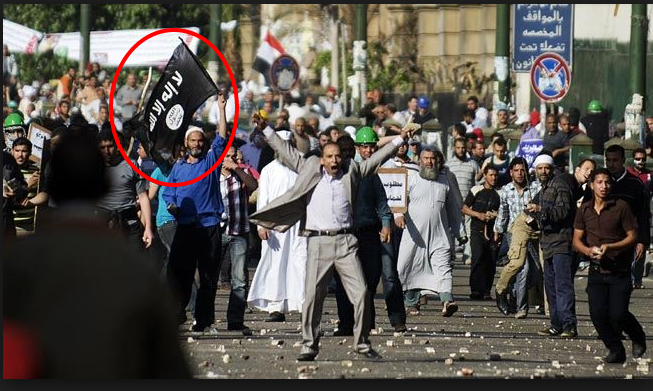 6 October 2013, The ministry of interior arrested 180 of the Muslim Brotherhood members and their supporters who committed violence and terror attacks. 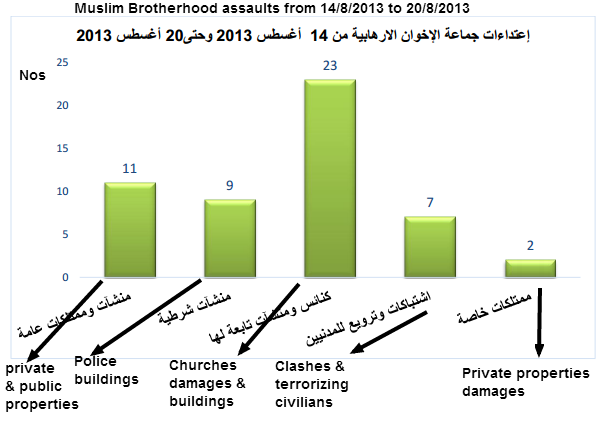 Damaged public and private properties in different areas in Cairo and Giza. Burned and destroyed public buses and private cars. Destroyed the entrance of the Agricultural center for researches. Destroyed private shops and terrorized citizens. Possessed firearms. Also 243 of MB elements were arrested for violence acts and terrorizing citizens with firearms in Ramsis and Glalaa street in Down town Cairo. 11/10/2013, In Giza, Muslim Brothers elements attacked 2 police individuals work in Giza security governorate, while they were checking security status in Alharam street, resulted both policemen injured with bruises and wounds in different parts of their bodies. In Cairo, Abbas Alakad street Nasr city, Muslim Brothers elements attacked police truck transporting prisoners and tried to release prisoners, security forces dealt with MB elements and arrested them. In Sharkia City, Aldaydamoun village, Fakus. Muslim Brotherhood elements attacked Abd ElAziz Elsayed, nick name Elbaz, 54 years old, he was suffering for diabetes and died right away after MB attacked him. Other clashes started between MB and Anti-MB protesters in the village. 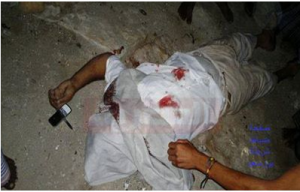 18/10/2013, Clashes between MB and Anti Brotherhood protesters in different cities: Sharqia, Alexandria, port said, Fayoum resulted one serious injury, Fathy Abd El Aziz by a gunshot in the neck, he accused MB supporters of killing attempt. 13 NOV 2013 Al-Arish City Abd ElMoneim Sayed Ahmed Police Sergeant was shot by masked gunmen in front of his kids and wife with 12 bullets under his home. 8/11/2013, Omrania, Giza. MB supporters started clashes with citizens, resulted 1 got shot in the chest by firearms, others got injured. In addition to damages to 25 cars and 1 garage got burned and 3 shops got destroyed in Omrania Alzahraa area. In Dakahlia, Matarya city, 4 persons injured by firearms, after MB elements started shooting randomly at the people in the area who rejected MB violent protests and their enmity to the armed forces. 15/11/2013, Alawayed areas in Alexandria. Muslim brothers started clashes with citizens and shot in the chest a 16 years old student Ihab Ahmed Selim, the boy died right after he reached the hospital. Mohamed Mabrouk 34 years old, was assassinated by masked gunmen who opened fire on the Officer’s car and shot him dead with 12 bullets. Mabrouk was the main eyewitness on the espionage case between Mursi, MB, and foreign intelligence from Qatar, Turkey, US and Hamas. 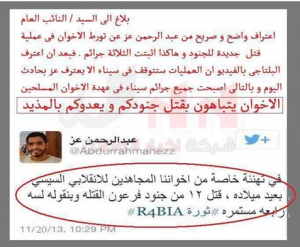 twitter account that killing 11 Egyptian Military Soldiers and injured 37 Soldiers on 20 Nov 2013 Sinai, is the Muslim Brotherhood Gift to General Sisi on his Birthday – Brotherhood were honored to kill the Pharaoh’s Soldiers and Rabaa’s Revolution continues!. 20/11/2013, Muslim Brothers elements targeted a military bus from the front and committed a suicidal attack, resulted 11 soldiers killed and 37 soldiers injured. 22/11/2013, Suez city. Muslim Brotherhood elements killed a 10 years old child Samir Ahmed Mohamed Mostafa with firearms. 4 others injured with deep wounds. 1 injured with a gunshot in the hand. Name of injured: Saiid Munir Abu Bakr 60 years old – Mostafa Fathy Atta Allah – Alsayed Zaky Attia 54 years old and Mahmoud Mohamed Abd Elaziz. 22/11/2013 Behera Kafr Eldawar city, Clashes between Brotherhood supporters and citizens, 9 injured, public properties damages: cars and shops. 22/11/2013, Nozha Cairo, Muslim Brothers elements set fire in the middle of the roads, destroyed and burned Ads signs, damaged gardens and fences and blocked the traffic. Shot a young man with firearms in the chest. 22/11/2013, Nissan car stopped in front of Kaed Ibrahim Mosque and randomly started to shoot at citizens in the street. 3 citizens injured with gunshots. 6/12/2013, Fayoum governorate. MB violence resulted the injury of lieutenant Karim Ibrahim from the special forces. 6/12/2013, Alf Maskan Cairo, MB violence resulted, burned and damaged public and private properties. 2 citizens injured with gunshots in their legs. 13/12/2013 Suez violent events, clashes between MB elements and citizens resulted 1 young man Khaled Saleh Mousa 23 years old got killed with firearms, 4 injured with firearms, 6 others injured with different wounds. injured with cut in the head – Ahmed Khalifa a gunshot in the knee – Mohamed Sabry 14 years old injured with gunshot in the neck. 4 other injuries unknown were moved to the general hospital. 20/12/2013 Fayoum Governorate. Brotherhood members used firearms against citizens and shot a 15 years old boy, Abd Elrahman Mohamed Elsayed and a 20 years old man Mahmoud Osama fikri with gunshots in the face. 24/12/2013, Dakahlia. Car bomb Explosion at Dakahlia security governorate Killed 13 and 134 injured. The explosion caused damages to many buildings and shops close to the security building. 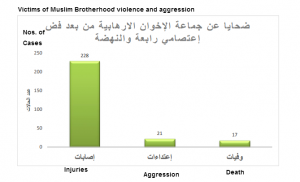 Muslim Brotherhood students violent events and terror acts in the universities. Cairo University 27/10/2013. Muslim brotherhood students used violence against other independent students, university employees, administrative security, professors and the chancellor of the university. MB students violent acts resulted, 3 students got brutally beaten. 2 employees were beaten and locked in one of the public relations rooms. 5 administrative security employees injured with deep wound in their heads. Muslim Brothers students smashed the plants pots and used the broken pieces in attacking other students. 27/10/2013, Bussat Karim Village – Dakahlia. 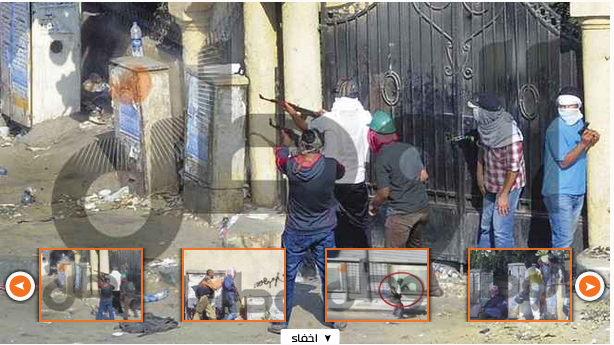 Muslim Brotherhood supporters violent acts resulted: 4 citizens got injured with white arms used by MB elements. Names of the victims and injuries: Aldossuky Ibrahim Eldin deep wounds in the neck and head – Bassem Mohamed Elbaz deep wound in the left hand – Adham Sabry Hegazy deep wound in the right hand – Mohamed Salah Mohamed deep wound in the head. Al-Zakazik University 28/10/2013. Brotherhood students locked Dr. Hamdy Shehab, the chancellor of the university in his office for 3 hours. Cairo university 29/10/2013. MB students attacked 2 independent students, resulted bruises and wounds in their faces. The administrative security rescued the two students and managed to stop clashes between MB and other students. they closed the university’s gates with locks. 18 students including 6 from the security got injured. Alexandria university 30/10/2013. 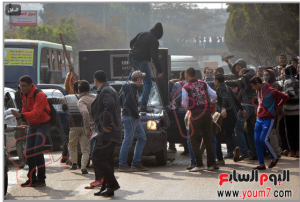 MB students used white arms, gunshots, sticks against other students. Resulted, 28 students injured with bruises, deep wounds, and private and public properties damages. 4/11/2013. 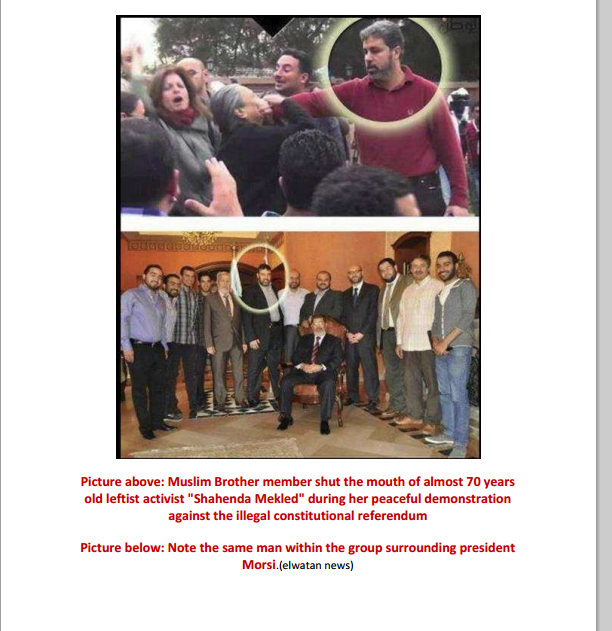 Cairo, a Muslim Brotherhood supporter slapped an old woman on her face when she was standing outside the court, attending the first trial of Mursi. She was calling for justice from MB terrorists, The MB supporter abused her with MB 4 fingers symbol, she pushed his hands away from her, so he slapped her on her face. 4/11/2013. Alexandria. 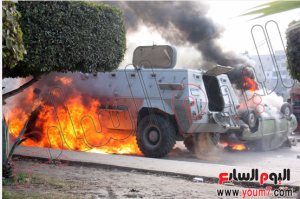 Muslim Brotherhood elements blocked the traffic and threw Molotov and used gunshots against civilians and police individuals, and destroyed and burned a public bus. Violent acts resulted: 3 injured from police forces. Names: Corporal Adel Ibrahim Elsayed injured with gunshot in his feet – Corporal Saadawy Abd Elsalam Awad injured with gunshot in his right foot – Corporal Hassan Mohamed Mussa had bruises in his face. In addition to 10 citizens with different injuries. Police forces arrested 27 attackers and seized 17 bottles of Molotov, Chemicals, a bag filled with stones. 6 November 2013, Munufia City. Muslim Brothers violent acts against citizens in Arab Elraml in Kuwessna city resulted different injuries of 4 citizens and were moved to the Kuwessna central hospital. Almansoura university 8/12/2013. Muslim Brothers students burned a police vehicle and central police tank in front of Al-Baron Gate. Police captain Ahmed Samir Hemeda 28 years old had severe burns in the face, hands and neck resulted from MB students use of Molotov and gasoline against security forces. 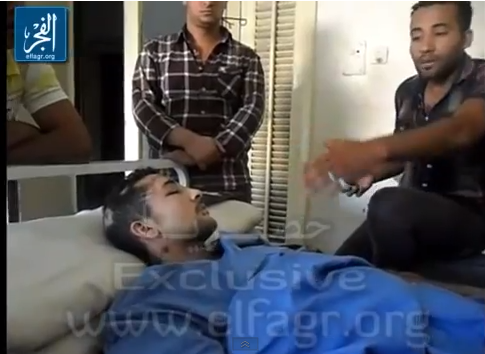 3 soldiers had different injuries including Osama Zaher police soldier who had severe injuries in his head. Muslim Brotherhood and sisterhood students of Alazhar university in association with foreign elements committed terror acts inside Al-Azhar university. 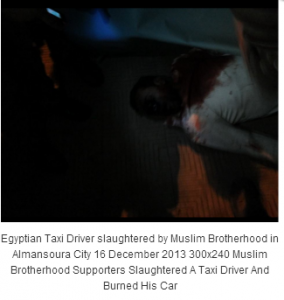 16 December 2013, Almansoura city, Muslim Brotherhood supporters attacked a taxi driver by stabbing him in different parts of his body, dragged him on the ground then slaughtered him and burned his taxi. Mohamed Gamal 33 years old, taxi driver was asking Brotherhood protesters to move from the middle of the road to let the cars pass, after they blocked Elgeish street and paralyzed the traffic. Muslim Brotherhood attacked him with knives, dragged him and slaughtered him and then burned his taxi. The victim was working hard to support his family. He worked as an employee in one of the companies, and in the evening he had a part time job as a taxi driver. Al-Zakazik university, 23/12/2013. About 30 Brotherhood students break into the Chancellor of Pharmacy college, Dr. Abdallah Alshanawany, attacked the chancellor and threw a cup of tea in his face, wrote on his clothes offended words, punched him in the face and caused him a heart attack. 29/8/2013, At 7.30 in the morning, about 300 Muslim Brothers elements terrorized passengers in the subway, they carried white arms and tried to attack passengers. The police forces arrested them and concerned authorities took necessary legal procedures. 30 & 31 August 2013, Muslim Brothers elements broke into the ladies carriages and tried to terrorize them. Police security arrested them. 300 others of MB elements failed is starting a chaos inside the subway, by damaging public properties and terrorizing passengers. They also have been arrested and legal procedures were taken against them. 18 September 2013, Al-Sahel DA office, Counselor Khaled Elatreby ordered imprisoning of 5 Brotherhood suspects for 4 days, accused of terrorizing passengers and blocking the roads in the subway. 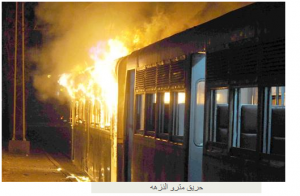 6 October 2013, Muslim Brothers supporters terrorized passengers in Hadaek Alkuba subway station, damaged and sabotaged furniture and metro trains. Used gunshots against citizens. Security forces arrested 12 attackers and legal procedures taken against them. 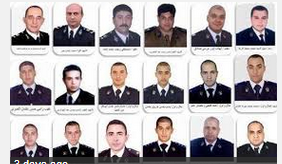 The name of the arrested attackers: Hatem Gamal Mohamed Saber – Ahmed Saber Ahmed – Ahmed Sayed Mohamed – Mohamed Mahmoud Ahmed – Mahmoud Ramadan Negm – Abdullah Zakaria Mostafa – Ahmed Mohamed Elsayed Abd Elal – Mostafa Mohamed Ahmed Aly – Abdullah Ahmed Mohamed Hussein – Ahmed Mohamed Ahmed Abbas – Fouad Fouad Hussein – Mursi Sayed Mohamed Ibrahim. Boston Bombing Was Meant to Deliver a Message; Similar Attacks Expected in France. The same cleric who announced publicly that if he will have the authority one day, he will destroy the Pyramids and all Pharaohs history and statues! 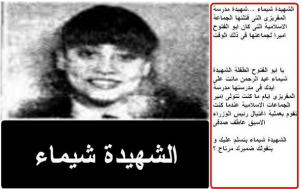 Kamilia Al-Sadat, daughter of late president Sadat: My father is responsible for all the blood shedding in Egypt, because he believed that Muslim Brotherhood will give up violence and terror, so he released them from jails, but he was wrong and unfortunately, he realized his mistake when he paid his own life for it. They assassinated him. Click here to watch the video.